It's rare to come across a person with as much magnetic, palpable verve as Kimberly Trowbridge, of The Trowbridge Atelier. She radiates creative energy—and it comes across in our conversation. When in conversation with Kimberly, the first thing you recognize is her abundant energy. It's the aura of someone who is doing exactly what they were meant to do. 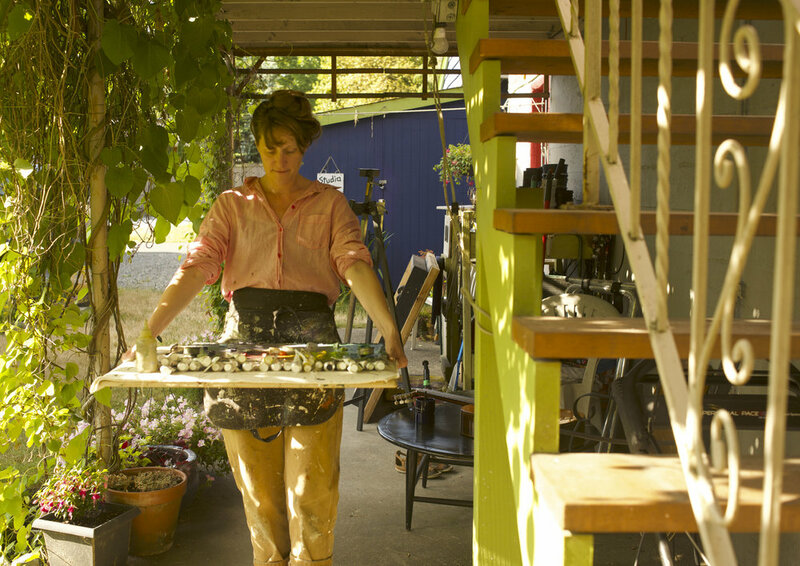 As a painter, Kimberly's energy is a stamp on her work. As a teacher and mentor, her enthusiasm is a force to draw inspiration and motivation from. Here she is speaking about her atelier, her study, and what drives her. Stefano Catalani: Kimberly, when did your passion for painting start forming? Kimberly Trowbridge: I have self-identified as an artist my entire life. Growing up, I built a ceramics studio and a photography darkroom in the basement of my house. There was a ladder in my closet to my tarot-reading room in the attic. My bedroom was my painting studio. My first true scholastic passion was for modernist literature and poetry. The very final semester of my senior year in college, soon-to-graduate with a BA in English Literature from Indiana University, I took a painting course with Tim Kennedy as a gift to myself. It was a revelation: I realized that my natural language is in the visual realm and that I wanted to write my poems visually. I ended up staying for two additional years and earned a BFA in Painting. These two years represent the most significant education of my life: I focused exclusively on my studio practice and the study of art history—under the guidance of Tim Kennedy, Eve Mansdorf, and Barry Gealt. Tim and Eve taught me the valuable lesson of what it is like to be a painter, to have a day-to-day practice, and operate with that as a real choice. I studied in Florence, Italy with Barry, and he taught me that I could have a very real and personal relationship with art history and that my unique self is a valid contribution to my visual tradition. My first loves are the Italian Renaissance painters: Giotto, Piero, Fra Angelico, Pontormo, Titian, Tintoretto. All of my paintings start there. SC: How would you describe your artistic practice? KT: Painting is my most powerful and direct tool for translating my experience. For over fifteen years I have maintained an incredibly prolific studio practice. My relationship to color, to mixing, to applying paint is a natural and deep part of who I am and how I engage with this radical experience of life on earth. The language of painting is the lens or the architecture through which I am able to see, to organize, and to understand my experience. With this language I have developed as an installation artist, a performance artist, a musician, a teacher, and a mentor. Painting for me is fundamental. It is the bone-marrow of my artistic and life practice. In particular, learning to plein-air paint has been the single most significant thrust in my artistic practice, and has led to my clarity about what kind of lifestyle matters to me. The ability to paint wherever I choose is liberating for me: this rigorously observational practice has re-aligned me with my particular strain of visual philosophy, by way of Cezanne. Painting from nature, for me, is the most direct means for studying color and space relationships. It is also a direct portal into the present moment, where I believe the only true sentient looking occurs. Like Cezanne, I am attempting to unite color and form. This past year, at my Top Hat home and studio I have been cultivating a garden and painting from underneath my deck all year long. My paintings have developed alongside my garden, and each plant has played a role: a character on a theatrical stage. My plants teach me everything I need to know about color. SC: Could you describe the Trowbridge Atelier and your approach to teaching and mentoring? KT: The Trowbridge Atelier is a true atelier in the old-school sense: It is a laboratory where I work alongside my students. It is a community of students that research and develop visual concepts, engage with art history, and contribute their individual approaches to painting. As a mentor, I make an agreement with my students: I support and witness the growth of your artistic self; she exists and is visible in this space. I acknowledge that every student who signs up for my Atelier is making a very important decision to place their artistic practice in a prominent position in their life. This is huge. It is both exciting and scary, as it effects all other relationships and events in that person’s life. As their mentor, I remain an advocate for that artistic self and a guide for them through this meaningful journey. This psychological journey is made possible through the physical, practical, day-to-day engagement with color concepts. My unique talent as an instructor is my ability to break-down color into a very usable and understandable language that artists can grapple with and make their own. We work from the life-model, from colored-paper constructions, and from individual studio projects. SC: Tell me more about your fascination with color and how it informs both what you paint and what you teach? KT: Color is so misunderstood. For many artists and students it is the most elusive formal element of picture-making. It is seen as the most emotional, subjective of the elements and thus most people shy-away from a direct and practical dialog with the language of color. For me, color is the gateway to all of the other formal visual elements. Color is form, not something added later on to form. It is through the building-blocks of color that form, composition, and space-relationships are built. This deep philosophical and practical belief aligns me with the birth of Modernism, by way of Cezanne. He was attempting to synthesize two major poles of artistic endeavor: the color-form of the Venetians (by way of Rubens and Delacroix) with the classical form of the Rome school (by way of Poussin). “Color Theory” can sound so drab and technical. It really should be called “Color Practice,” because for me it really isn’t about theories, but rather the day-to-day experience of mixing and responding and developing a lexicon out of color experience. For over ten years now I have been developing my Color for Painters course that has been incredibly meaningful for me as a teacher and as an artist. Understanding color in its component parts—as value, as temperature, as intensity—and understanding that all of these parts are relative (i.e. defined by what surrounds them both locally and globally within the composition), is an exciting and rigorous study for translating optical experience. I teach this language and it is very empowering for my students. Developing a logical and personal relationship to color, for me, is the starting place for creating a unique and articulate visual statement. SC: What are you currently excited about? KT: So much is exciting for me right now, Stefano! I am in a really healthy and expansive place with my work and my practice. This past year I have been developing a major body of large-scale paintings based on the plein-air studies that I make in different landscapes— spanning from the Alentejo region of Portugal, to the magical Twisp, WA, the Oakridge Forest, OR, and my own backyard at Top Hat Studio. Several of these paintings will be on view at 24HR MART, in Twisp, WA in the exhibition PRISMATIC OPTICAL PHENOMENA: Seven Painted Canvases that Attempt to Convey the Unification of Parallel Landscapes Through the Prism of Her Inner Self. In addition, I am thrilled to announce that I will be leading Gage's annual Florence, Italy tour in July, 2018! [past]. Studying the works of the Italian Renaissance masters was the most significant formative experience for me as an artist. The pictorial tradition of the Renaissance painters continues to inform my artistic practice in fundamental ways. This trip is an exciting opportunity for me to return to Florence, to the roots of my tradition, and to engage students in the act of looking and creating through the perspective of a contemporary artist. Also, I will be lecturing on color at Gage Georgetown on August 16 [past: 2017]. It's entitled "Color Talk: A performative lecture on color theory using real painted examples!" SC: Thanks, Kimberly. Sounds like we have much to look forward to. KT: Thank you, Stefano, for your meaningful questions. I so appreciate your insights about art and art history, and the dialog you bring to our Gage community.